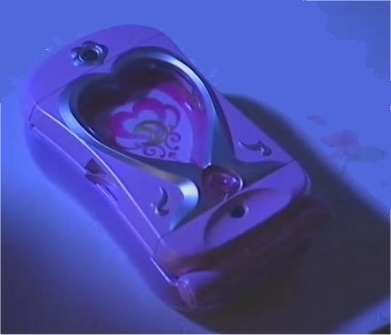 This cell phone was the very first thing Luna gives to Usagi while she tries to convince her of her Sailor Guardian destiny. Usagi assumes she is dreaming and goes back to bed rather than listening to plushy Luna. So Luna leaves this item with her and tells her to use it to contact her when she's ready to become a Sailor. Later on the Teletia S proves to have a couple of other unique properties that help Usagi out. For one thing, it can act like a regular cell phone and she uses it frequently to communicate with the other Sailors. Another interesting use is of the more magical variety- it acts in lieu of the disguise pen from the manga and anime to produce different disguises for Usagi. She can use it this way by taking a picture of the intended disguise and then turning into them. As a side note, the Teletia S holds the photos used to create the disguises and can be re-used later. It seemed to have unlimited storage for disguise photos. It also doesn't matter which sailor soldier uses which Teletia S- the other soldier's disguises will work on each other so long as they are holding the proper cell phone. 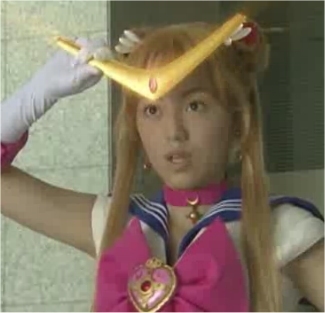 These items allow Usagi to transform into Sailormoon. The locket starts the transformation and the lipstick activates it (it is possibly also a pun on "Make Up"). This item can do a couple of things. 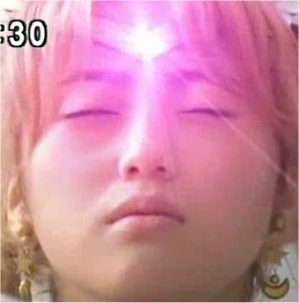 It flashes to help Usagi regain her "soldier's senses" in the beginning to help her remember how to fight, and again later when she is in danger of transforming into a youma. 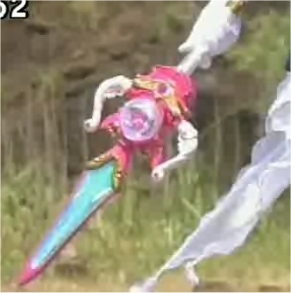 It is also able to transform into the tiara boomerang when it is needed for that attack. 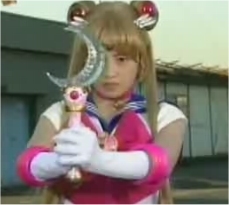 This wand can perform two attacks: "Moon Healing Escalation" and "Moon Twilight Flash". 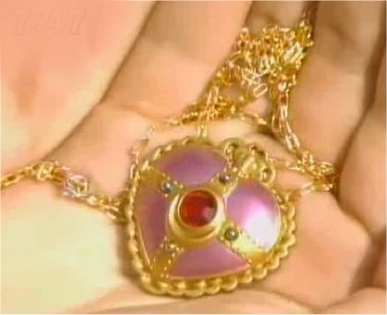 It appears from Usagi's heart moon brooch when she is fighting the first youma. This is a one year passport to Crown Karaoke. 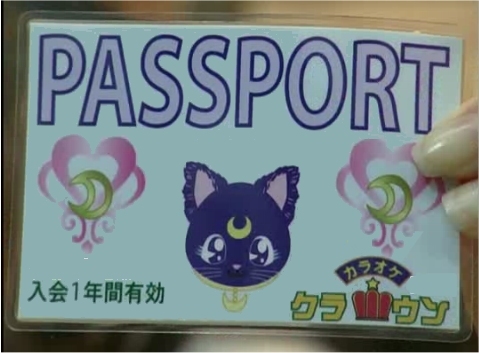 It is a necessary item to have because Luna creates a headquarters for the Sailor Senshi in the karaoke, claiming to be "borrowing the space". Though not lethal, this item can distract the enemy or cut bindings, it is used in the attack "Moon Tiara Boomerang". The maboroshi no ginzuishou [mystical silver crystal] is an extremely important item. The Dark Kingdom wants it, and it is directly linked to Queen Metallia, so whenever it is used Queen Metallia gets stronger. 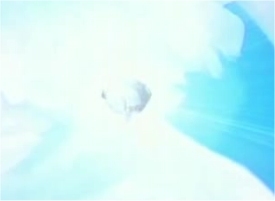 It appears after Mamoru has been fatally wounded in battle and Usagi begins to cry. It is formed from her tears and heals him. 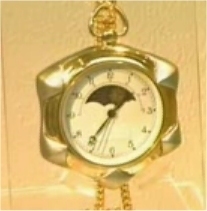 This is a watch that Usagi admires in a shop window while on a date with Mamoru. To her surprise and delight, Mamoru buys the watch for her. After he is taken by the Dark Kingdom, the Moon Phase helps to remind Usagi of him as well as helping her to keep her promises to him to hold her emotions in check and refrain from activating the maboroshi no ginzuishou. This is one item, but transforms between the harp and the sword. As a harp it has healing capabilities. 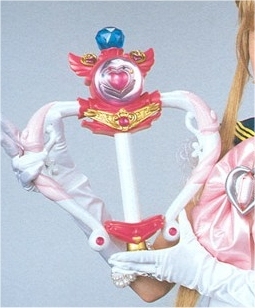 As a sword, it helps to unleash a powerful attack and absorbs energy and attacks thrown at Princess Sailormoon.